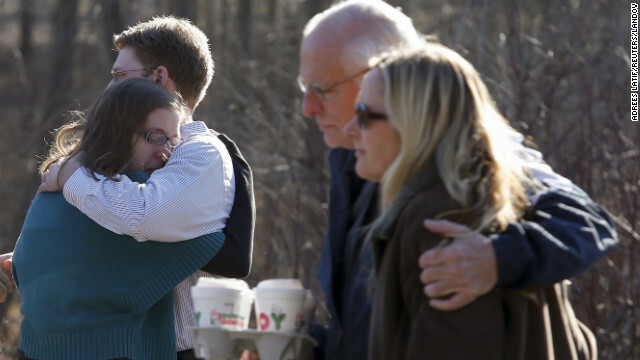 Family members embrace each other outside Sandy Hook Elementary School after Friday's shootings. (CNN) -- Residents of Newtown, Connecticut, took to social media Friday to share their fear, shock and horror over the shootings at Sandy Hook Elementary School. Several people on Twitter expressed concerns about relatives who attend or work at the school, where a law-enforcement official said at least 18 children were slain after gunfire erupted Friday morning. Others posted images from the scene and from a nearby fire station, where survivors were taken. A hospital in nearby Danbury posted a Facebook update late Friday morning saying that three victims were being treated there. In what now seems like a much more innocent time, the school hosted a winter concert Thursday. Principal Dawn Hochsprung, who was killed in the shootings, had posted a photo on Twitter Wednesday of a rehearsal for the concert. Do you live in the Newtown area or know people at Sandy Hook Elementary? Share your views in the comments area below or post your thoughts on CNN iReport.